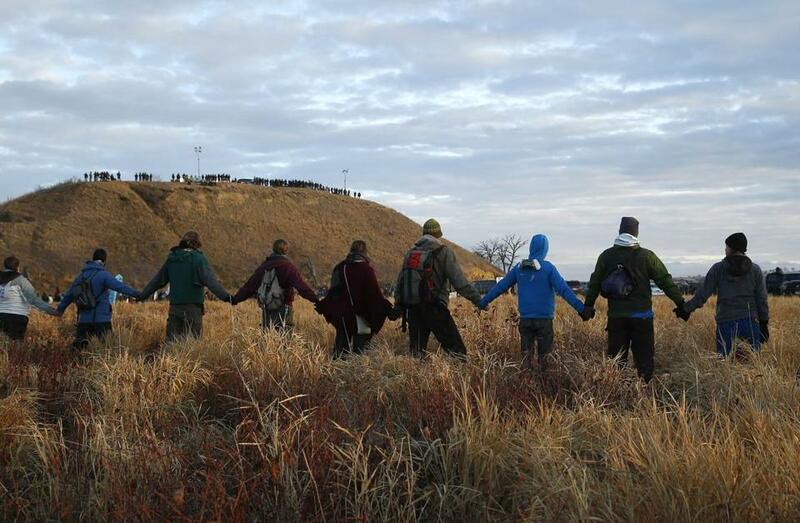 In November, protesters joined hands as police lined the hill at Standing Rock. WASHINGTON — The Army said Sunday that it will not approve an easement needed for the Dakota Access Pipeline to cross under Lake Oahe in North Dakota, a victory for the Native American tribes and thousands of others who have protested the project. Officials in November had delayed the key decision, saying more discussion was necessary about the proposed crossing for the four-state, $3.8 billion project. Plans had called for the pipeline to pass very near the reservation of the Standing Rock Sioux Tribe, whose leaders have repeatedly expressed fears that a spill could threaten the water supplies of their people. The line also would have passed beneath a dammed section of Lake Oahe that tribes say is near sacred burial sites. ‘‘Although we have had continuing discussion and exchanges of new information with the Standing Rock Sioux and Dakota Access, it’s clear that there’s more work to do,’’ Jo-Ellen Darcy, the Army’s assistant secretary for civil works, said in a statement Sunday. Many celebrated Sunday evening after the US Army Corps of Engineers said it won’t grant an easement for the pipeline. ‘‘The best way to complete that work responsibly and expeditiously is to explore alternate routes for the pipeline crossing,’’ Darcy said. It was not immediately clear whether the incoming administration would support the decision. President-elect Donald Trump has said he supports finishing the project. Trump owns stock in the company building the pipeline but has said his support has nothing to do with his investment. What started as a small but fierce protest in a remote spot along the Missouri River months ago has evolved into an epic standoff involving hundreds of tribes, various celebrities, and activists. About 250 military veterans joined the protest Sunday. The standoff has involved heated confrontations — police have sometimes employed water cannons, pepper spray, and rubber bullets — and has carried on through the swelter of summer into the snowy cold of winter. On Sunday, news of the Army’s decision triggered a wave of celebration and relief among those who have fought to stop the 1,170-mile-long pipeline’s progress. ‘‘We wholeheartedly support the decision of the administration and commend with the utmost gratitude the courage it took on the part of President Obama, the Army Corps [of Engineers], the Department of Justice, and the Department of the Interior to take steps to correct the course of history and to do the right thing,’’ said Dave Archambault II, chairman of the Standing Rock Sioux Tribe. ‘‘With this decision we look forward to being able to return home and spend the winter with our families and loved ones, many of whom have sacrificed as well,’’ Archambault said. 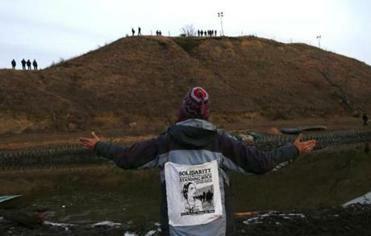 Environmental groups that protested alongside the tribes also rejoiced at the decision. ‘‘Today, the voices of indigenous people were heard,’’ Rhea Suh, president of the Natural Resources Defense Council, said in a statement. In the Dakota language, the word ‘‘oahe’’ signifies ‘‘a place to stand on.’’ The Standing Rock Sioux Tribe and its allies in the environmental and activist movements had said they were doing just that: using Lake Oahe in North Dakota as a place to take a stand by setting up camps and obstructing roads to block the Dakota Access Pipeline and its owner, Energy Transfer Partners. The pipeline, if completed, would connect the Bakken and Three Forks oil production areas in North Dakota to an existing crude oil terminal in Illinois. At 30 inches in diameter, it could transport an estimated 470,000 barrels of oil per day. Army officials said the consideration of alternative routes would be best accomplished through an environmental-impact statement with full public input and analysis, a process likely to take many months. Interior Secretary Sally Jewell praised the Army’s decision. ‘‘The thoughtful approach established by the Army today ensures that there will be an in-depth evaluation of alternative routes for the pipeline and a closer look at potential impacts,’’ she said. ‘‘The Army’s announcement underscores that tribal rights reserved in treaties and federal law, as well as Nation-to-Nation consultation with tribal leaders, are essential components of the analysis to be undertaken in the environmental impact statement going forward,’’ she said. Energy Transfer Partners had said it was unwilling to reroute the project. The company and the Morton County sheriff’s office, which has done much of the policing of the protests, had no immediate comment on the Army’s decision. The federal government had ordered people to leave the main encampment, which is on Army Corps of Engineers land, by Monday. But demonstrators said they were prepared to stay, and authorities said they would not forcibly remove them. About 250 members of the group Veterans Stand for Standing Rock gathered earlier Sunday about a mile from the Oceti Sakowin, or Seven Council Fires, camp. Art Grayson, 29, of Cambridge, Mass., a Navy veteran and Harvard graduate student, told the Associated Press that he came to the camp as part of the veterans group because he thought the demonstrators could use his help.